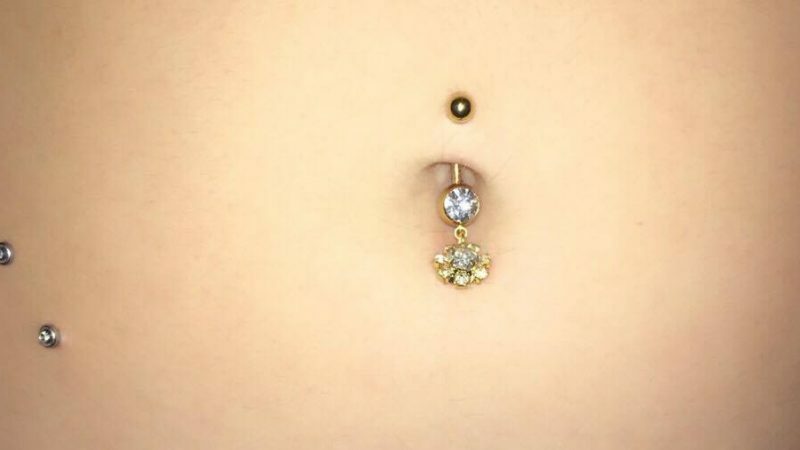 The popularity of body piercings has continued to wane stronger in the fashion world with more and more people adopting it as an avenue to make signature style statements. Over time, some piercings style have appealed to a wider range of piercing enthusiasts, effectively setting the precedents for the creation of fashion trends that witnessed marked acceptance by body jewelry faithful around the world. Which trends stood out the most read on to find out? 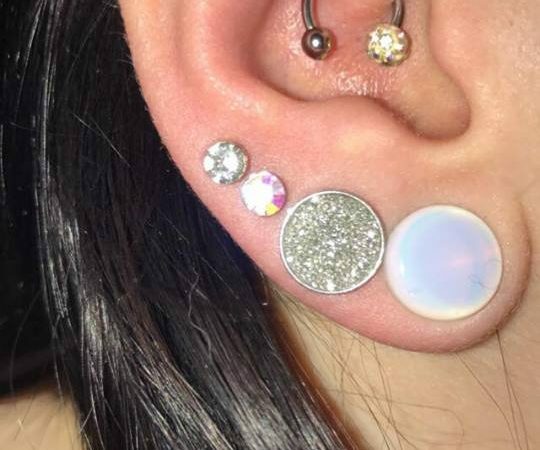 A quick survey/peruse of popular photo sharing sites like Pinterest and Instagram reveal that these modded adaptations of earlobe piercings have successfully gained a tremendous amount of traction in the body jewelry world. The trending conformation of constellation piercings is a symmetrical juxtaposition of three already traditional earlobe piercing styles; conch, daith and helix. 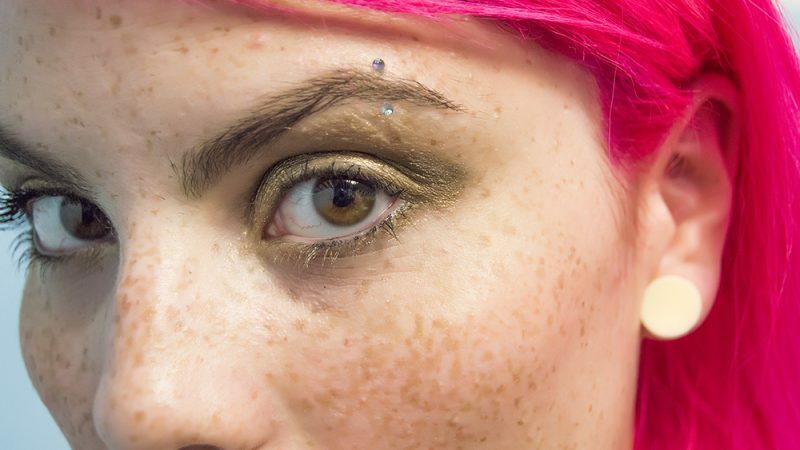 Of the various facial piercings, eyebrow piercings stand out as the most exclusive. This piercing trend which is more popular in males than in females was its boost to acclaim a worldwide recognition to the rise of punk culture. The last few years has seen the trend metamorphose from a once antediluvian piercing category to a widely accepted/modernized piercing style adorned by A-list celebrities like Stacy Ferguson. Guaranteed to imprint an offbeat and peculiar smile on the face of the user, smiley piercings have accorded notable followership due to their seemingly simple yet intricate orientation. In countries like the UK, the adoption rate of this piercing trend is off the charts. 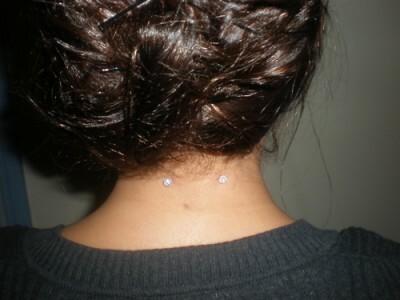 The signature piercing category for the more adventurous body jewelry enthusiasts. They exude an air of glamor and outlandishness while enhancing a picturesque image of the user. It’s a favorite piercing category amongst male and females alike and has remained relevant in the piercing scene for quite a long time. Belly button piercings are the true definition of class and elegance. 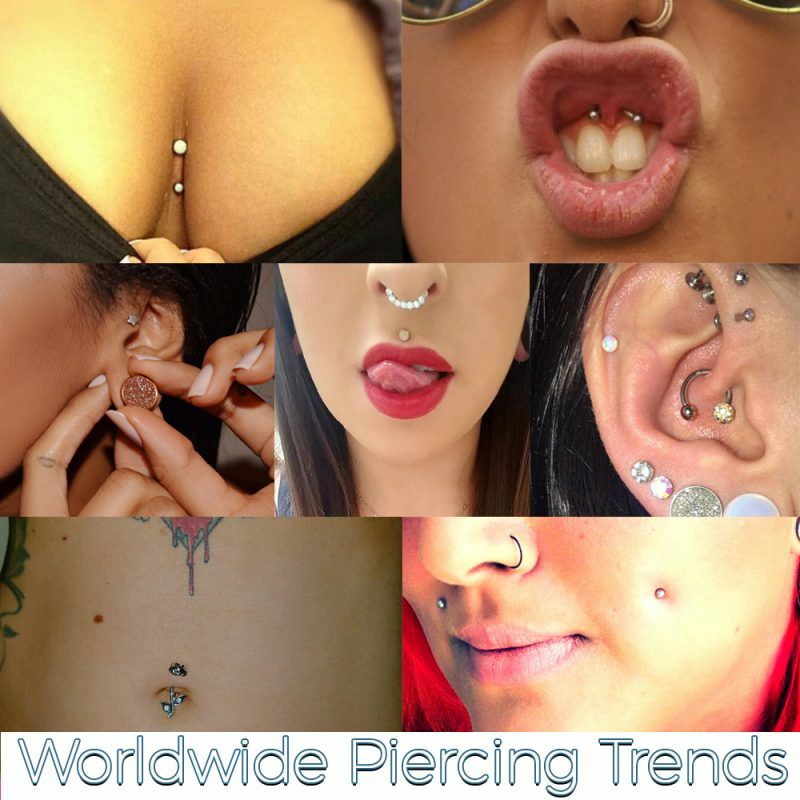 A prominent piercing trend in the US and select African countries it has outlived several generations of piercing faithful since it became fashionable in the Britney Spears era. Its ability to subtly accentuate the curves and beauty of the feminine physique have guaranteed its continued relevance in the world of body jewelry. These piercings commonplace in South American countries are strikingly unique on viewing. Unlike other piercings that have a visible entry and exit holes, dermal piercings have an endogenous aura potentiated by the absence of an exit hole. This makes them look and feel like an extension of the individual’s body features. Of the Aforementioned which is the most used? Without a doubt, the most used and universally accepted category of piercings are earlobe piercings. In some cultures, it is even customary for females to have their earlobe pierced very early in childhood. From Asia to Africa, throughout Europe and the Americas earlobe piercing is a piercing tradition that transcends geographical boundaries. Eyebrow Piercings/nose piercings; these piercing categories go hand in hand, as it is quite rare to spot an individual with a solitary eyebrow piercing devoid of a complementary nose piercing. Both piercing categories have seen marked acceptance in Asian countries like India where it is adorned by male and female folk alike. Bellybutton; in the early 1990’s navel piercings in vogue and pretty much every hip and trendy lady in the US had one. Like I pointed earlier the popularity of this piercing is backed up by its immense aesthetic appeal on both the male and female body. According to research conducted by Quaranta et al., the average age for getting the first piercing amongst college students was 15years, however in societies where piercing (notably earlobe piercings in females) are more of a custom, the average age for piercing is just seven years.